Your mom’s been diagnosed with Alzheimer’s. While every case is different, the first few years usually entail her asking the same questions repeatedly. She’ll still be able to function well enough on her own. Eventually, your mom needs daily care. She won’t remember to take her medications. If she remembers, she will forget she’s already taken them. She may forget when she last ate or drank. She might start to wander. She’ll become anxious and fidgety. She may forget if she fed her pets. She’ll be told to stop driving and let others take her to appointments. You want to be the person offering the care your mom needs. It’s hard. In many ways, caring for a person with Alzheimer’s is like having a newborn. There’s no way to predict your mom’s mood, things she wants to say, or what she’s in the mood for. You need elderly care services to help you get through this. Here are four ways elderly care services can make life better for you and your mom. Alzheimer’s disease alters sleeping patterns. Your mom may suddenly start sleeping till noon and staying up until 2:00 a.m. If you’re an early bird, you’re going to lose a lot of sleep. You don’t want to leave your mom up unsupervised. Caregivers make it easy to get the sleep you need without leaving your mom alone. 2. Your Social Life Doesn’t Have to Be Impacted. When you care for your mom, you give a lot and get little in return. Many family caregivers find their mental and physical health are impacted. Make sure you let a professional caregiver take over and go out to dinner, drinks, or something fun. You need time to be social. Removing yourself from your mom’s house for a few hours helps keep you from burning out. 3. Your Mom Gains an Experienced Assistant. If you’re trying to help your mom get showered and dressed, she may be embarrassed. She doesn’t want her child seeing her at her most vulnerable moment. It’s also going to be awkward for you. 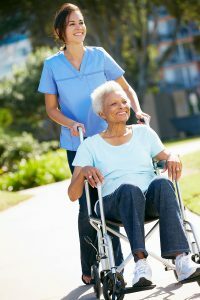 A caregiver is trained to help with these difficult tasks. 4. Your Mom Doesn’t Have to Leave Her Home. Staying at a family home that’s familiar and comfortable is often better for your mom. She won’t be in a strange location. You do need to make sure that she has around-the-clock care. As Alzheimer’s progresses, your mom will struggle to eat. Trained professionals will have experience that you lack. Partner with a caregiver to learn as much as you can without being alone to face the difficulties. Are you ready to gain a friend and partner in your mom’s Alzheimer’s care? Call an elderly care agency now and set up an appointment.